This is an updated recipe from the Macheesmo Archives! I’ve heard a rumor that crispy oatmeal cookies can match or even beat the soft, chewy, raisin-packed oatmeal cookies that I know and love. I was skeptical (very), but I decided to give them a shot. 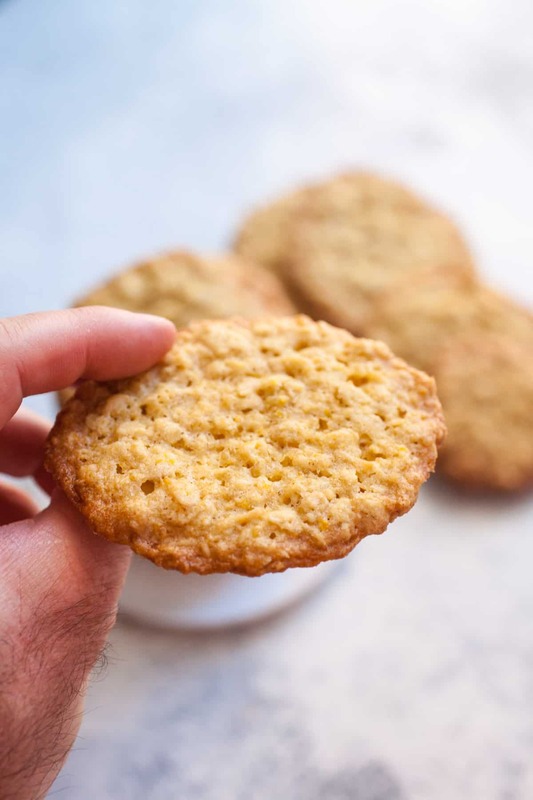 The idea behind these cookies is that you use a bit more leavening powder to make the oatmeal cookies spread out during baking and therefore crisp up. But are crispy oatmeal cookies really good? YES! And they are stackable. In the cookie universe, I like to think of oatmeal cookies as healthy. Sure, they have some butter and sugar as all cookies do, but the oats lend a real heartiness and lots of fiber. So they’re kinda healthy cookies! These crispy oatmeal cookies are the evil step-child of the soft raisin-packed oatmeal cookie. Thin, laced with orange zest, and crispy! Very addictive! 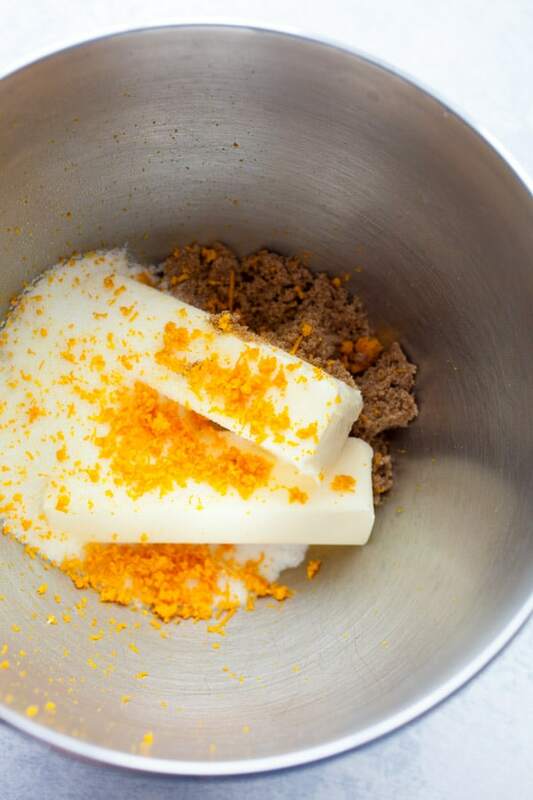 1) Add butter, sugars, and orange zest to a large bowl. 2) Using a hand mixer or stand mixer (or I guess a fork/whisk combo attack), cream the butter into the sugar on medium speed. 3) Add a large egg and vanilla extract. 4) In a separate bowl, combine the dry ingredients except the rolled oats. 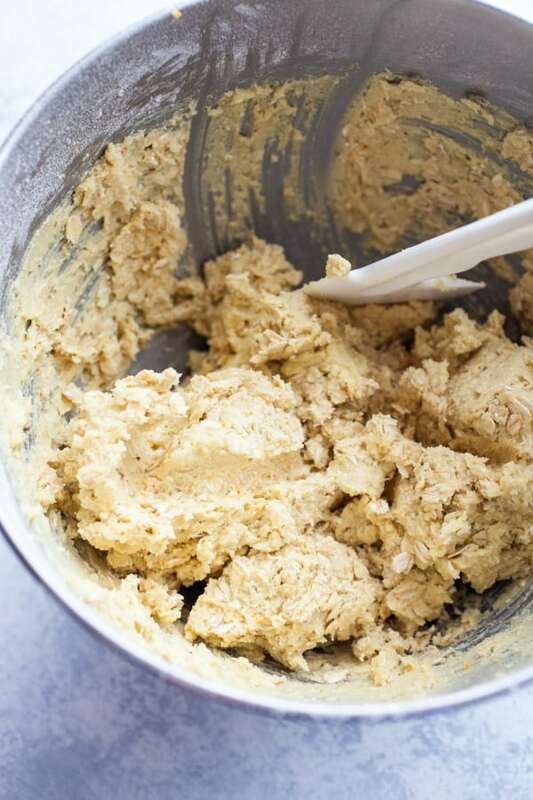 5) Slowly incorporate dry ingredients into butter mixture. 6) Mix in oats, 1/2 Cup at a time. 8) Using a spatula (fingers), mush the dough down until you have small disks that are about 1/2 inch high. 9) Bake for 14-16 minutes and if they appear to be cooking unevenly, rotate the sheet halfway through. 10) Once the cookies are lightly browned around the edges, take them out and let them cool on a wire rack. Let them cool on their baking sheet. From The Best of America's Test Kitchen. It might look like a lot of ingredients for cookies, but most of them are standard pantry ingredients. This dough is really no different for from a standard dough. Start by adding your butter, sugars, and orange zest if your using it (I totally recommend it) to a large bowl. Using a hand mixer or stand mixer (or I guess a fork/whisk combo attack), cream the butter into the sugar on medium speed. After a few minutes you should have a smooth, thick mixture that would be delicious if you were to eat it with a spoon. Instead, add a large egg and your vanilla extract. In a separate bowl, combine your dry ingredients except the rolled oats. Then slowly incorporate your dry ingredients into your dough. After everything is mixed together well, mix in your oats, 1/2 Cup at a time. Don’t mix your oats into your dry ingredients first because it will make it hard to get your flour and leavening things equally distributed. Once your batter is mixed well, preheat your oven to 350 degrees. On a baking sheet place heaping 1 tablespoon balls of dough with a good amount of space in between each ball. You should get 24 balls out of the batter. I only got 23 because I’m crazy like that and I didn’t really measure them. Seriously though, don’t put more than 8 of these on a sheet at a time. You’ll thank me later. Then, using a spatula (fingers), mush the batter down until you have small disks that are about 1/2 inch high. Bake these for 14-16 minutes and if they appear to be cooking unevenly, rotate the sheet halfway through. 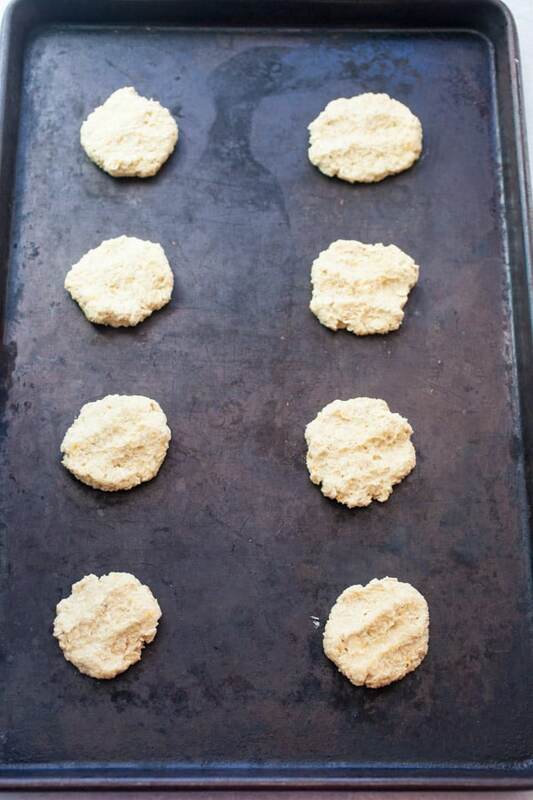 Once the cookies are lightly browned around the edges, take them out and let them cool. And here is the important trick to these cookies: Let them cool on their baking sheet. Don’t take them off. This will mean they’ll continue to crisp up a bit while they cool, but they won’t burn. If you’re cookies are touching, feel free to cut them apart a bit. After they cool completely, you can eat them immediately or, if you’re like me, form a cookie structure of some sort. It’s very possible that these crispy oatmeal cookies converted me from the oatmeal cookies I know and love. They were packed with flavor but still really light and had a perfect texture. Plus they’re pretty straightforward to make. And they’re healthy(ish)! Basically, there’s no reason to not make these cookies! And that rumor I was talking about at the beginning of this post… yea… I think I’m going to start spreading it. These changes created a wonderful orange oatmeal cookie! The egg substitute didnt change the taste or texture, and I will definetly be making this recipe again! I just made these, yummmmy! I replaced the brown sugar with organic coconut sugar, and used Bob’s gluten free flour, replacing 3 T. of the flour with 2T. Ground flax seed and 1T. Chia Seed. I also added 1/2 cup organic cranberries sweetened with blueberry juice and 1/2 cup tiger nut flour. I made them smaller in 1 1/2 T. balls and flattened with my spatula. They have a honey graham taste with orange flavor. Very crispy! Yum for anytime snack. Thanks for the crispy cookie recipe! I love crisp cookies, these look perfect! That’s how I like them…crispy! Never understood why folks like them chewy. I’m curious…could I put raisins in these crispy cookies? Or are raisins really more of a soft oatmeal cookie thing? I have made these cookies for years and sometimes add 1/4 cup of chopped raisins to them. They are just as crunchy and crispy with, or without the raisins. @ Claire… I wouldn’t. I think they might just caramelize and/or burn and they might stop the cookies from spreading evenly and therefore crisping up. You could try it but I make no guarantees :) I would stick with zest. It works great to add flavor. My grandmother’s friend used to make these. They are some of the best cookies I’ve ever had. Delicious! Yikes! These oatmeal cookies have more butter than flour and hardly look healthy. Is it possible to cut out half the butter and lighten up cookie? I like ’em crispy and chewy. And raw, if I’m being completely honest. ‘Cause there’s nothing better than cookie dough. These look great! Thanks for the recipe! This recipe is right out of Cooks Illustrated, Jan 08, I think. For a variation, add toasted chopped walnuts and dried cranberries while cutting the oatmeal to 2 cups. My cookies have ended up like a mound and chewy. I yearn to make thin crispy like yours! @Iona. But there’s 2.5 Cups of oats! :) It works out to be about 1 1/2 – 2 Teaspoons of butter per cookie. I wouldn’t substitute it because they turned out so perfect. They are actually very light as is. @Wennie. Yep! The book I linked to is just a compilation from Cook’s Illustrated. It’s an excellent book. These look delicious! I love a crispy cookie. I love watching America’s Test Kitchen and they always have such good pointers! I think I prefer crispy cookies too especially when it comes to oatmeal. They just taste more wholesome that way. I managed to get 14 cookies out of this recipe, though I have that problem with all cookie recipes. :P I always make big cookies! They turned out awesome though! Great recipe. Maybe next time I’ll try and make them smaller (or you know, not). These look awesome. 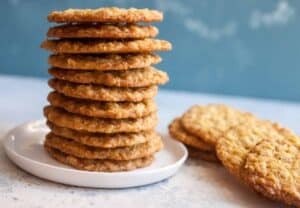 I have a suggestion for a somewhat healthier (less butter) recipe for chewier oatmeal raisin cookies: http://www.goeggless.com/2008/11/eggless-chewy-oatmeal-raisin-cookies.html. I made them (substituting a frozen banana for the apple sauce) a few weeks ago, and they were the best I’ve ever made. Check it. I'm so used to trying to perfect the chewy cookie, I haven't even tried a crispy one. Maybe I'll fair better with this one. It looks great! I sent this link to my Dad, who likes to try new things and loves oatmeal cookies, and he has made them twice since. His favorite, now. He didn't have a tool to grate the orange peel so he just squished up the orange pulp and juice and threw it in (no rind) and he loved them. He may have increased the oatmeal a bit to absorb some juice, but they turned out perfect. I love crispy cookies, so I tried this one. It turned out fanastic, except… it wasn't all crispy, the middle part is a bit chewy (not that anyone at my house complained, haha), Was it supposed to turn out that way? The snags I hit while cooking were 1) determining the amount of butter – where I live a stick of butter = 227 grams, how bout you? – 2) room temp butter, i don't think i was patient enough, it might've still been a bit cool when I began mixing. Would those factors be the cause to my prob? 1 Cup of butter = 227 grams. But a stick (at least in the US) is only 1/2 a cup. I used 14 Tablespoons which is a bit under 1 Cup (16 Tablespoons = 1 Cup). If you're weighing which is always a good idea honestly, the recipe would call for 199 grams of butter. The room temp thing just makes it easier to mix. Shouldn't affect the final cookie that much as long as you still get everything mixed well. I just made these cookies yesterday. DEEEEEELICIOUS! And I’m not even a big fan of oatmeal cookies! The Boyfriend loves them, and so did all my coworkers. I put craisins in mine and it turned out wonderfully. I’m planning on making them with chocolate chips next. p.s. Boyfriend’s favorite all-time recipe is what he calls the “Macheesmo stuffing” (from way back when). He asks for it to be made on his birthday. That too is a keeper! These cookies are exactly what I was looking for, as I love a crispy cookie. The orange zest is a great addition. I am off to make another batch! I don't bake a lot. Or, you know, ever. Could I add a bit of ginger to this recipe? Extremely good! I have been looking for a crispy oatmeal cookie. Yum! These came out amazing! My father-in-law loves crispy cookies and oatmeal are his favorite so this was a total WIN-WIN! I made some with raisins (I just put them on top before baking) and also made a batch where I cut the sugar by half and added half a cup of chocolate chips and 1/4c of chopped walnuts! So good! Thank you for sharing! Awesome Tracie! Glad you liked them. Thanks for posting the changes you made. Sounds delicious. Thanks for the recipe, I just made these and they are divine. I am a crispy cookie convert!! They have changed my world :) So buttery and crispy, but not in a Chips Ahoy kind of way. I want to post about them on my blog soon, is that okay? Oooh… I made these this morning and WOW! What an incredible texture, flavor, and smell! My senses have really been revitalized thanks to these awesome citrusy cookies. I never really liked the chewy oatmeal cookies, but these are perfect. loved, loved the cookies! awesome and perfectly crunchy…just the way i want them. baked them last night and now they’re all gone! thanks so much for the great recipe. will definitely make them again…and again…and again! Trying/baking these now, I’m looking for a crispy cookie and will probably try every one of them to make sure they’re crispy ;) thank you for the recipe and I am sure my family and I will love them! I tried this recipe today.. It’s not really super crispy, in fact, it’s slightly chewy.. But good. The oats however did not seem to be cooked. What kind of oats should I use? Currently I used rolled oats. The packaging says to boils it for about 10 minutes to cook. Hey Dianne, I used just normal rolled oats. Are you sure you didn’t use thick rolled oats? Sometimes they are a bit thicker (and it should say that on the packaging). If that’s the case the cookies will probably come out okay but maybe a bit chewier. But yea… I just use normal rolled oats. :) Good luck! Just ate my first cookie from this batch. Excellent, even after substituting Splenda for the sugars. They are not quite as brown as I would like, but that may be due to the Splenda. 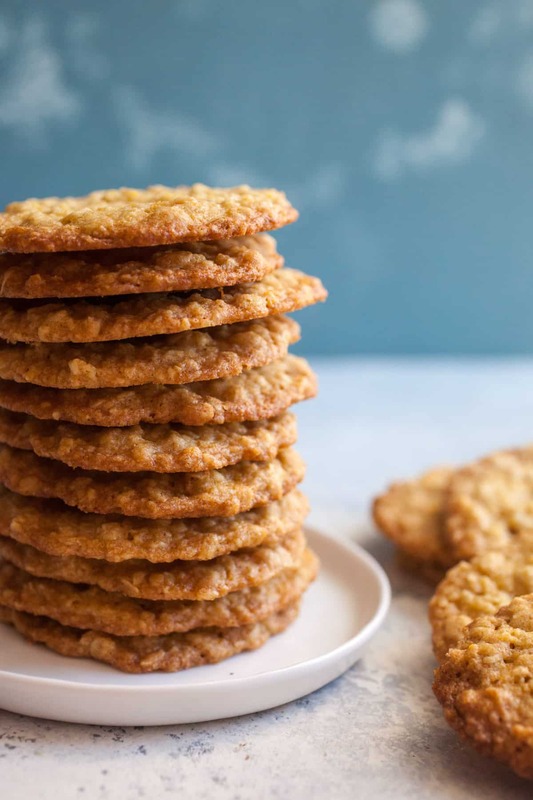 I have finally found a tasty, crispy oatmeal cookie recipe that I will be using time and again. I have been looking for crisp oatmeal cookies for “awhile”. I guess not in the right place. My husband is a crisp oatmeal cookie fan. This is it no changes. It’s the only cookie he wants me to make. Thank you. I am a fan. I used artificial sweetener which usually makes cookies disappointingly cakey, but these worked once I flattened them extra flat before baking. Crispy and awesome – thanks! In your crispy oatmeal cookie recipe you said to add 14 tbls or 1-3/4 sticks of butter. Since I am from Canada and do not want to dole out 14 tbls of butter and we do not buy butter in sticks here in the North, how many lbs.or ounces is all of this. We buy butter in pounds. A lot of recipes from the U.S. do not use ounces or lbs. in some recipes – they use tbls or sticks. Thanks for your help. P.S. I will be making these cookies in a few hours. If you have time, could you answer my questions. Hey Joanne, 2 tablespoons is an ounce of butter so that would amount to 7 ounces. Hope that helps! Being a diabetic and still wanting to try this recipe, I used Splenda grandulated sugar and Splenda brown sugar as a substitute. The cookies still tasted great. The only problem (and it wasn’t a really big one) was that the cookies did not spread out as far as the ones in your pictures look like. I can only assume this was due to the substitution of the Splenda. I just wanted to say I’ve been making these for the last three years and everyone loves them. I actually get request to make them quite offen. Thank you for sharing, this by far is my favorite cookie! They look good, but this isn’t a recipe, it’s a NOVEL! Just give us the RECIPE!! Hey Lorna, you can always just click show recipe or print recipe under the ingredients to just see the step-by-step recipe. Hope that helps! Made these using all-purpose gluten free flower so I could share them with all my guests. They were delusions! I also used a little more than 1Tab scoops & it double the about of cookies. I will be making them again often. I loved reading Beth’s comment – love a delusional biscuit! Always use the zest. It sets this cookie over and beyond all oatmeal recipes. Ha! An old one but a good recipe! Never goes out of style. Glad you like them Judy! Once baked and stored airtight. Do these stay crispy for a few days? We can’t wait to make this recipe this weekend. My son loves cooking and cookies are always a favorite. Keep the wonderful recipes coming! Crispy is an understatement! These are delicious. Added some raisins and they were divine. Reduced white sugar by 1/4 cup and would probably reduce it by another 1/4. 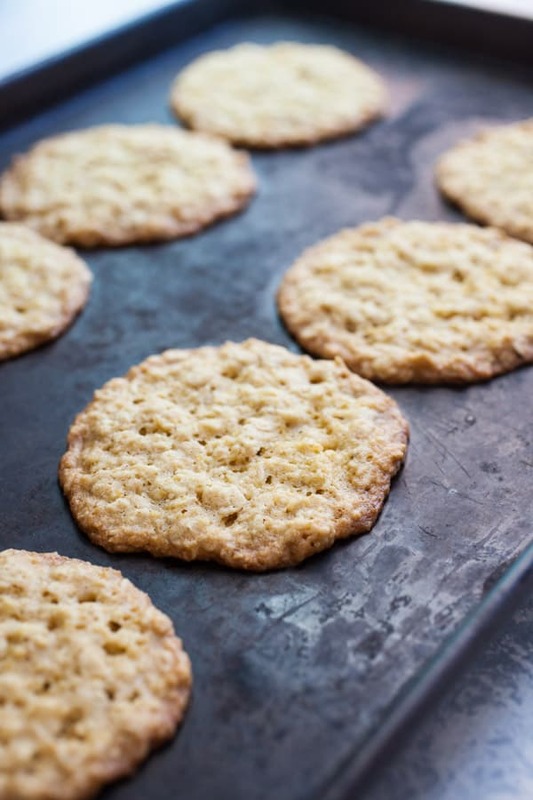 These are exactly the crispy oatmeal cookies my husband likes best! You didn’t mention in the recipe, but leaving them on the baking sheet only about a minute makes them easy to get off. I’m sure I’ll be making these again! to bake correctly. I’m sure that it’s due to elevation since it takes much longer for anything to cook but then they are very dry.. If you have time could you give me high-altitude instructions? Hey Jan, that actually doesn’t sound like an elevation problem. It sounds like maybe an oven problem! If you moved and have a new oven, I’d get a cheap oven thermometer and test your oven to make sure it’s registering the right temperatures. Sometimes ovens can be off by 50-75 degrees which can obviously affect baking time. Altitude shouldn’t affect baking time much. I make these cookies at 5300 ft (denver) and the only change I make it slightly reduce the baking powder to 1/2 teas.